Prepare brownie mix according to package directions for batter; add egg(s), and substitute milk for water and melted butter for oil. Set aside. Beat the mascarpone, cream cheese, sugar and egg in a large bowl until blended. Crush 10 cookies into crumbs; fold into mascarpone mixture. 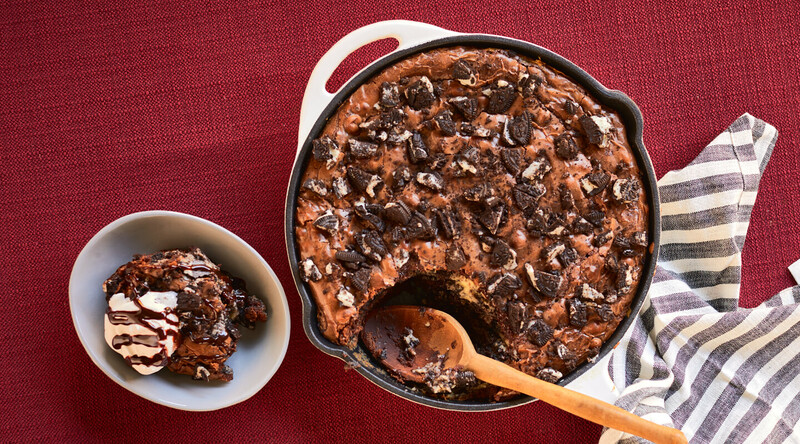 Pour two-thirds of the reserved brownie batter into a greased 10-inch cast-iron skillet; dot with mascarpone mixture. Spread the remaining batter over top. Bake for 25 minutes. Meanwhile, cut the remaining cookies into pieces; sprinkle over top. Bake for 10-15 minutes longer or until center is just set. (Take care not to overbake.) Cool in pan on a wire rack for 15 minutes before serving. Garnish with toppings as desired. For best results, sub milk for water and melted butter for oil when preparing the mix in this recipe. The preparation instructions vary per brand of brownie mix — the additional ingredients and amounts of each are on the back of the box. Crave Brothers Farmstead Classics Mascarpone cheese is luxurious and smooth; it’s crafted with fresh, sweet cream from high-quality milk produced at the family’s dairy.